The girl just learned how to peel potatoes at Thanksgiving, so she peeled some, and now she’s grating the potatoes. Sigh, my little girl, so grown up… Last year we didn’t have any applesauce, so we just grated some Golden Delicious apple- which was a tasty alternative. This year, we have some homemade applesauce, but I forgot to take it out of the freezer…so we might grate some apple again. Sour cream is also a traditional topping, but now that we have tried French onion dip, I’ll never go back. Soak the potatoes in cold water for an hour, then drain and press out as much water as possible. Mix the potatoes, onion, salt and pepper, then add the flour and baking powder. 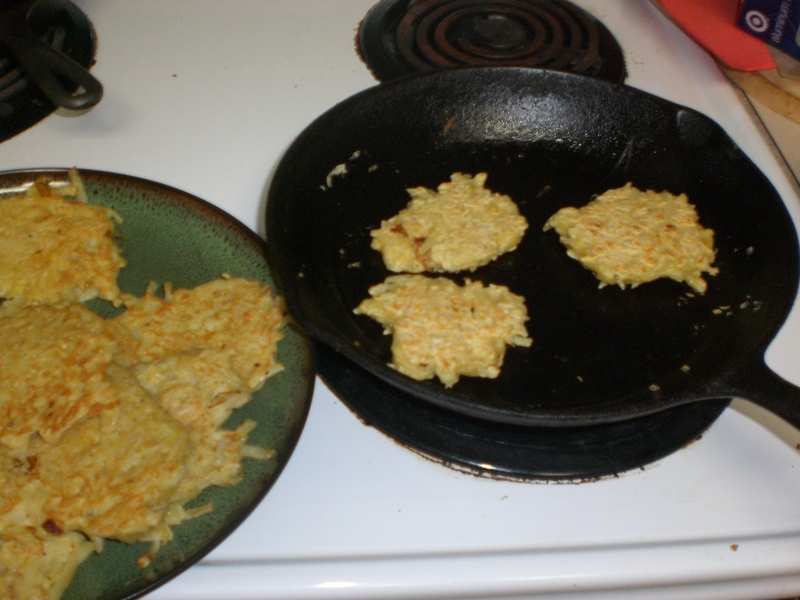 The flour makes the latkes hold together when they fry, but too much and you lose the crispiness. Add eggs and mix well. Drop the mixture by tablespoons in a well greased, hot frying pan. Spread out with the back of the spoon. Cook on one side until golden brown, then flip. Eat immediately, or save up on a plate in the oven set on 200. The advantage to doing this is that everyone gets to eat together, but the disadvantage is that they really are best fresh out of the frying pan. I think it is worth it for everyone to eat at the same time. This recipe makes about 15 or 16 latkes. YUM!!! I’m a fan…I love….